Granite is a great choice for kitchen countertops, providing a beautiful, affordable and durable material for a perfect finish to complement any design plan – and the edge plays an important part. The edge literally refers to the edge, or ends, of the countertop and there are several types of design available that all bring their own great qualities to a kitchen. Many homeowners pick granite because it’s a sturdy material that brings a unique look to a kitchen, boosting the value of a room with a visual that never goes out of fashion. It can withstand heat from pots and pans, it’s easy to clean up regular spills and it’s perfect for a busy room. 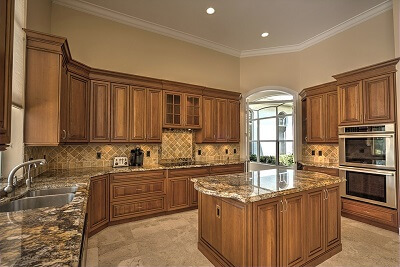 However, when opting to use granite countertops in a kitchen, that’s just the start of the decision-making process. Granite is available in a wide variety of shades and styles, and once the pattern has been picked out, the next thing to decide is what edge to use. To help in figuring out which style might be right for the kitchen, here’s a description of five of the most popular granite countertop edges on the market. Sometimes the simplest option is the best option, and here a straight edge stands out. Chiseled to a hard flat/straight edge (as the name implies) this is a basic but beautiful choice. A waterfall edge continues whatever design is on the surface of the countertop and flows it from the top and then vertically down the sides. This is a perfect style to choose for a visually attractive option that will help give a kitchen a modern yet timeless appearance. A bevel is a vertical or horizontal slope, and one option for a granite countertop edge is to have a single bevel slope of varying size. A double bevel builds on this by providing two such slopes, which can be stacked one on top of the other. Alternatively, one bevel could be made on the underside of the edge sloping up, with the second bevel on the top of the edge sloping down. Rounded like the tip of a bull’s nose, this classic finish gives a soft, smooth edge to a countertop. It’s available as either a half bullnose or a full bullnose. A half bullnose has a slight rounded edge at the top that curves down into a flat bottom, making for a subtle finish. Alternatively, the full bullnose is a more prominent, deeper curve that gives a rounded edge from top to bottom. The half bullnose has a softer look, while the full bullnose helps give a countertop a thinner look. Opting for a double radius edge means giving a granite countertop a dramatic curved finish. The larger the radius used, the larger the curve. Although the bullnose is similar because it’s a curved edge, the double radius has two curves, with one on the top, and one on the bottom. With several different and equally attractive styles to choose from, the only hard part about picking a granite countertop is therefore deciding which edge will work best in the kitchen.